Miah took a big step today with her first ever trail ride as a SAFE horse — possibly the first of her life — and she did great!! It’s only just recently that she’s gotten to a point where she was ready to hit the trails, and she was a very good girl. To be fair, she did snort for the entire two hour trip, but she was also very brave, crossing bridges and dealing with a lot of new stimulation. The only thing that bothered her were the bicycles, but by the end of the ride, she was even dealing with them with bravery. 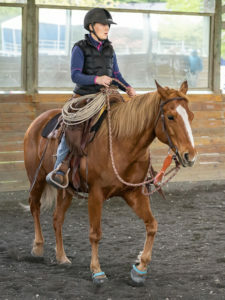 Brittney, who loves riding at the Redmond Watershed, was really impressed with the kindess of the people that they encountered out on the trails, especially the bike rider who took time to assure Miah that he was not a predator. 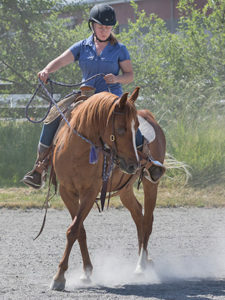 Brittney rode Kat, who had a good day on the trails, and Miah was ridden by her regular volunteer rider, Casey. 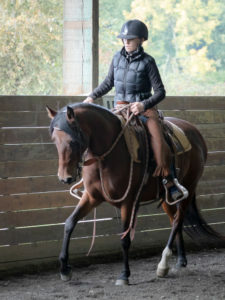 Brittney tells us that Casey and Miah are doing great together, and that Casey has been pretty successful in getting Miah to relax and listen under saddle. So thank you, Casey, for putting in time to help Miah along! We really appreciate the work that you’re doing with her! !